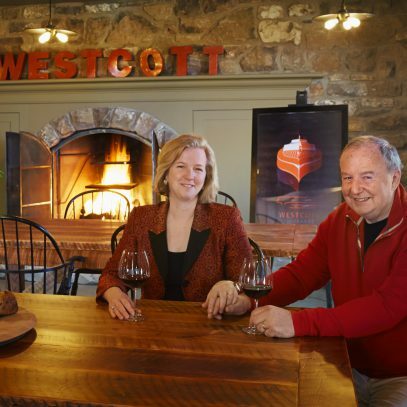 Westcott Vineyards and Winery is a small, artisanal winery focused on hand-crafted Chardonnay and Pinot Noir wines. It all starts in the vineyard where the wine grows. In early spring our crew prune the vines under the direction of their viticulturist Alain Sutra. They aim to achieve optimal vine balance by carefully gauging each vine's maturity, vigor and health and pruning accordingly. Throughout the growing season they follow "sustainable" vineyard practices. They use only natural fertilizers and make many small decisions to obtain optimal balance in their vines and soil. They believe that lower yields in the vineyard produce a better-quality wine. In their vineyards, their pruning approach and the use of natural practices results in yields of 1.5 tonnes per acre. The vine canopy is thinned throughout the summer so that the clusters of Chardonnay and Pinot Noir can benefit to the maximum of all the natural contributions of clay loam soil, limestone, sunshine and bountiful rainfall that Niagara has to offer. In the fall when the grapes have reached their natural level of maturity, they are hand-picked and then sorted again so that only fully mature fruit enters the winery. At the winery, winemaker Casey Kulczyk takes over. The grapes are hand sorted to ensure only the finest fruit is processed. They believe in minimal manipulation in the winemaking process. They produce low volume hand-crafted authentic Niagara wine where "terroir" and growing conditions typically produce subtle variations from year to year. Each year they strive to make better wine not more wine. As a team they are convinced that they can make VQA wines that sit among the best in the world. A Niagara College Graduate and awarded young wine professional, raised in small town Ontario amongst the corn and canola, Casey has always been an inspired individual. Early on in his career Casey realized that intimate and innately unique relationship one can have with wine, particularity those created through the lens of Pinot Noir and Chardonnay. This chosen path lead Casey to define his practical studies at Flat Rock Cellars first with Marlize Beyers, then again with Ross Wise. From there he travelled to NZ and saw Pinot and Chardonnay in a new more playful light at Saint Clair Estate. Focused to follow his passion, Casey became the first international intern to work at the young but now storied California domain of Rhys Vineyards. His last and most recent step brought Casey to Jackson-Triggs where he wanted to witness the efficiencies and scale of a large respected producer, but most importantly, to help grow and expand and developing traditional method sparkling program. Casey is excited to lead winemaking at Westcott Vineyards. He is thrilled to define the wines of the domain, focused on depicting place by paying tribute the unique character of some of the best vineyards in Niagara through artfully crafted still and sparkling Pinot Noir and Chardonnay. Great wine, quality wine, is really a story of passionate people. Why? It’s simple. Great wine is crazy hard work. And growing Chardonnay in the Cool Climate Vinemount Ridge appellation is harder than most. It requires year round dedication to tending grapes and vines. Every vine and every bunch of grapes is checked, pruned, thinned, managed and every rough weather day teared and sweated. This is what quality in wine means to them, while passionate is really another word for nutty. They’re passionate about making extraordinary wine. Thankfully, they’re not alone.